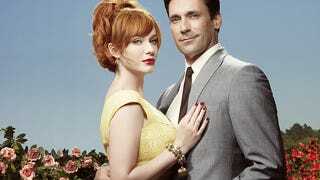 Will Don Draper and Joan Holloway Get It On in Season Five? "The Don/Joan dynamic is something that we do explore [this season], and don't take this the wrong way, but we do explore as the show goes on. They have worked together for a long time, they know one another very well and I'll leave it at that." Well, that vague promise definitely worked on me. Here's hoping.